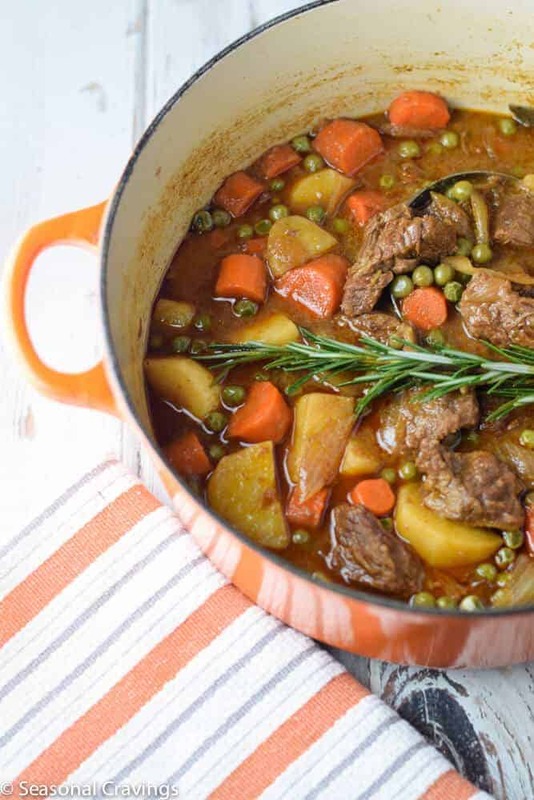 This Apple Cider Beef Stew is gluten free and full of comfort. It’s easy to throw together and tastes great the next day. It’s the perfect meal to make for company over the holidays. Are you having house guests over the holidays? We are having a full house for the next two weeks. We have my parents staying for 10 days – thanks, hubby – then his family for a few days after that. It’s always nice to have meals planned ahead so you aren’t slaving away in the kitchen when you could be relaxing with your guests. 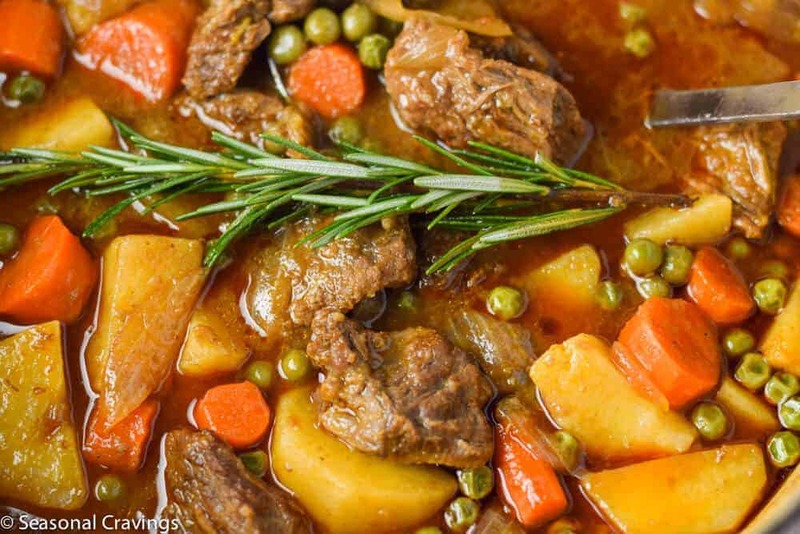 This Apple Cider Beef Stew is a family favorite for us and tastes great the next day. We eat a lot of beef stew in the winter and I make it several different ways. I have a Guinness Stew that is great when we have dinner guests, but my kids don’t like it. 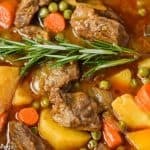 Giada DeLaurentis has a great beef stew recipe with red wine, but my kids won’t eat that one either. 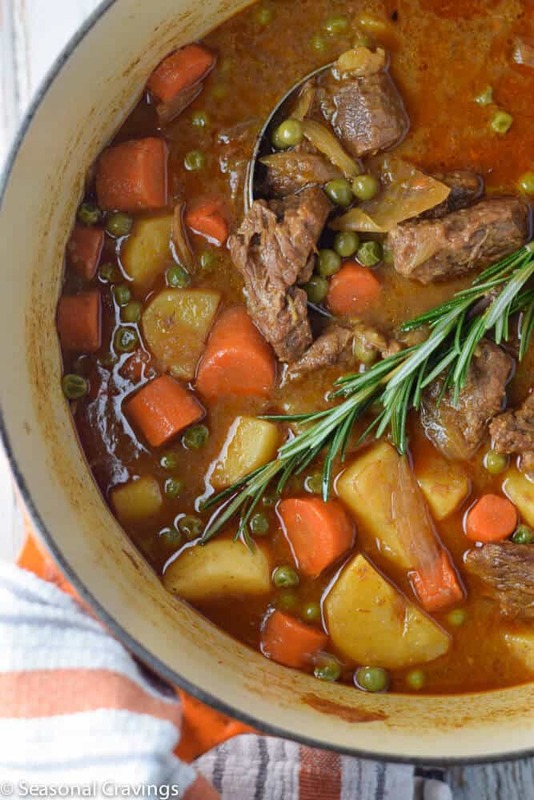 They prefer a lighter tasting broth and this Apple Cider Beef Stew fits the bill. It’s almost sweet, but the sweetness can be adjusted by using less apple cider and more beef stock. I’ve tried a lot of different substitutions to make beef stew gluten free and this is my favorite so far: I used quinoa flour to replace the regular flour in the browning stage. The quinoa flour has a very mild taste and helps to thicken the broth. Then all you have to do is make sure your beef stock is gluten free. I prefer beef stock over beef broth because it has more flavor. You can tell by how dark the broth is ↓. This Apple Cider Beef Stew if infinitely adaptable. You can add your own spin on the vegetables by using sweet potatoes, turnips, butternut squash or parsnips. I don’t add tomatoes to my stew but feel free to add a can of diced tomatoes. It’s almost impossible to mess this up. 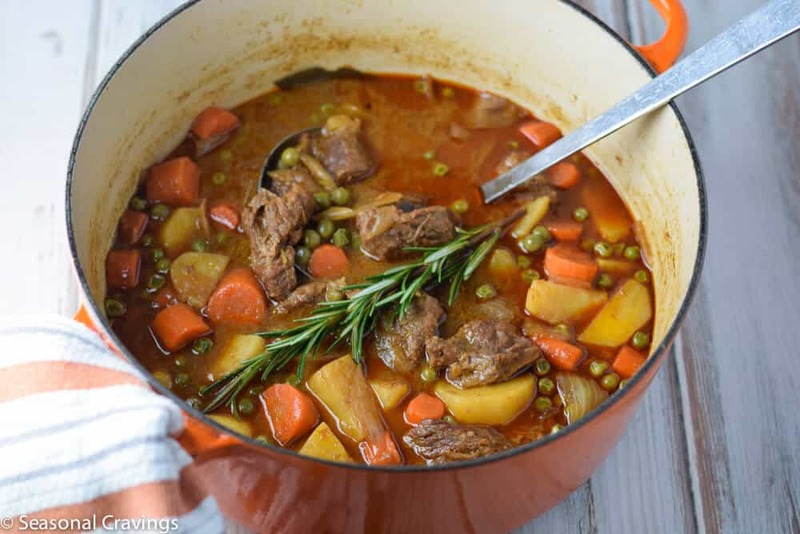 This Apple Cider Beef Stew is gluten free and full of comfort. It's easy to throw together and tastes great the next day. It's the perfect meal to make for company over the holidays. Add 2 tbsp of olive oil to a dutch oven over medium hight heat. Put quinoa flour in a small bowl and toss each piece of beef in the flour. Shake off the excess each time and throw away any leftover flour. Brown beef on each side. You will need to do this in two batches so you don't overcrowd the pan. Transfer the browned beef to a plate and set aside. Add 2 tbsp oil and saute garlic for 2 minutes. Add onions and cook for another few minutes. Add the tomato paste and cook for a few minutes. Add beef with any juices back to pan. Add broth, cider, bay leaves, and rosemary to the pot. Bring to a boil then reduce heat to low and simmer with the lid on for about an hour, stirring occasionally. Add carrots and potatoes and cook for another 30-45 minutes or until everything is tender. Add frozen peas and cook for a few more minutes. Garnish with fresh rosemary or parsley. Season to taste with fresh pepper and salt. Looks so cozy and comforting! Love it. Love it! You can never go wrong with comfort and this shouts comfort! Photos are mouthwatering–I want a plate of this right now! Thanks so much Mahy. Cold weather comfort at it’s best. This was delicious! Sounded like a crazy amount of apple cider but it really worked. Some of the kids were wary of this, but everyone tried it and everyone loved it. The beef was super tender. It made a nice big batch and 2 had it for leftovers for lunch the next day. Had never made beef stew before but will add it in the rotation. Thanks, Karen! Sarah, thanks for letting me know. I’m so glad the boys liked it! I agree. It’s the perfect cold weather meal and it’s 23 degrees here right now! Aw, thanks. I hope you have a cool evening to try it out! Oh my gosh, Karen, my mistake !!! Haste makes waste. Thanks for setting me straight! I had just made a huge batch of Fire Cider that calls for Apple Cider Vinegar so that was on my mind!!! Now it explains why the children like your recipe better with cider – sweet apple cider!